Doug Lenhardt concentrates his practice in the areas of Criminal Defense, Bankruptcy, and Personal Injury. Since 2002, Doug has served the Athens community developing a reputation as a amenable yet aggressive attorney who will zealously fight for his clients. Born in Atlanta, Doug grew up in Gwinnett County prior to attending the University of Georgia and the UGA School of Law. Doug maintains a network of contacts throughout the state and practices across North Georgia in addition to the Athens area. 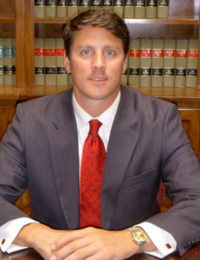 A member of the Georgia Bar, Doug is also licensed to practice before the Supreme Court of Georgia, the Georgia Court of Appeals, and The United States District Courts for the Middle and Northern Districts of Georgia. Doug has also been admitted pro hac vice in the Northern District of Ohio. Doug has successfully represented hundreds of clients in criminal matters including DUI, Drug Possession, Drug Sales/Distribution and Drug Trafficking; Family/Domestic Violence, Assault, Battery, Theft, Robbery, Burglary, Kidnapping and False Imprisonment; as well as less serious offenses such as Underage Possession of Alcohol, Shoplifting, and traffic/license violations. Doug has also guided hundreds of clients though the bankruptcy process and has won millions of dollars in settlements and judgments of both injured and deceased persons and their families including a judgment for over $3.5M in a wrongful death case. 17 years since Doug Lenhardt was first licensed to practice law.